Spurred by a twofold impetus, the fact that most of the 250,000 members of the Service Employees’ union depended on work in the cores of major cities and in Chicago, specifically, the beginning of a year-old plan for downtown redevelopment totaling $1,500,000,000, the Marina City project was hyped from the beginning. The railroad had owned the property for a century, and it was on this site that the log cabin of Dr. Alexander Wolcott, a government Indian agent, built near the cabin of John Kinzie. 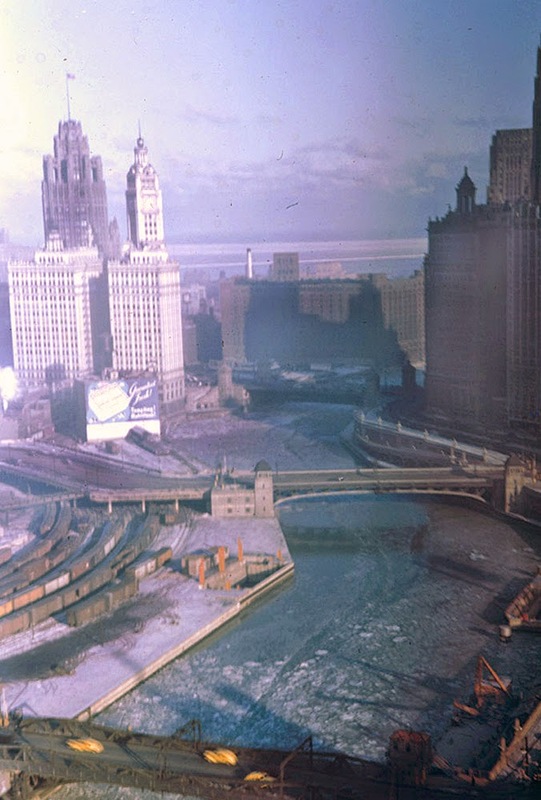 The price for the land on which Marina City stands today was pegged at three million dollars when the railroad unloaded it. As plans were refined the original design for the project changed. It grew taller – from 40 to 60 stories – making it the tallest housing structure in the world and the fourth highest building in Chicago. The first five floors would be used for entrances, service facilities, and stores with the next 14 floors providing space for 900 cars. There would be 256 efficiency units, 576 one- bedroom units, and 64 two-bedroom units. There would be space available for 700 small pleasure boats. These plans would also change as the design was refined. the groundbreaking ceremony. Bertrand Goldberg is the man with the big smile. 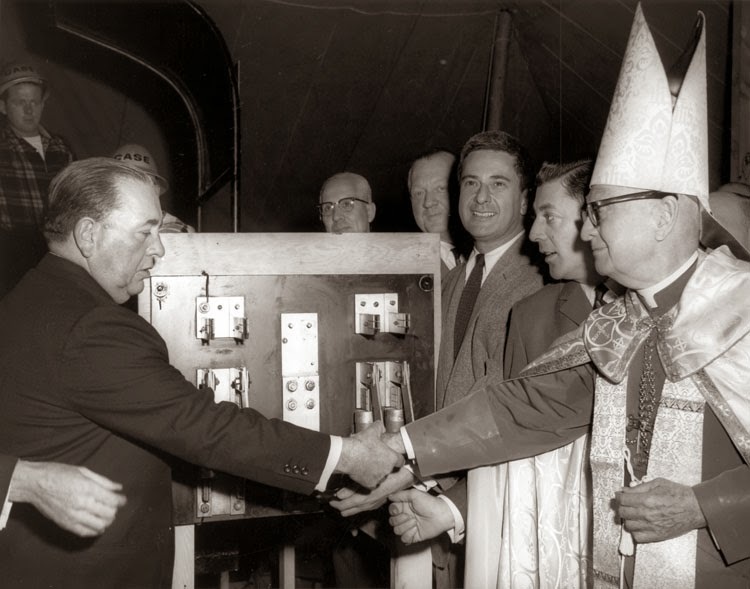 The Groundbreaking ceremony took place on November 22, 1960 and included a phone call from the newly elected President of the United State, John F. Kennedy, who probably figured he owed Mayor Daley the courtesy of a chat after the closely contested election. And the distinctive towers began to rise. The construction was not without trouble. Three workers were killed in September of 1961 in a 43-story fall in the collapse of part of a form that they were helping to raise. In June of that year seven workers were injured when a construction hoist fell ten floors. There were several small fires, including one in which butane tanks being used to dry new concrete exploded in the west tower stairwell. Even the home of the building’s developer, Charles r. Sweibel, was robbed while the family was off boating. I like to think that Chicago is a people place, and Marina City is, if it is anything else, first and foremost a place for people, a place that provides those people with one of the most breath-taking views of the city that can be found. All these buildings are very huge and beautiful. If you need more advice, Gordon Rutty can help you in an effective way.